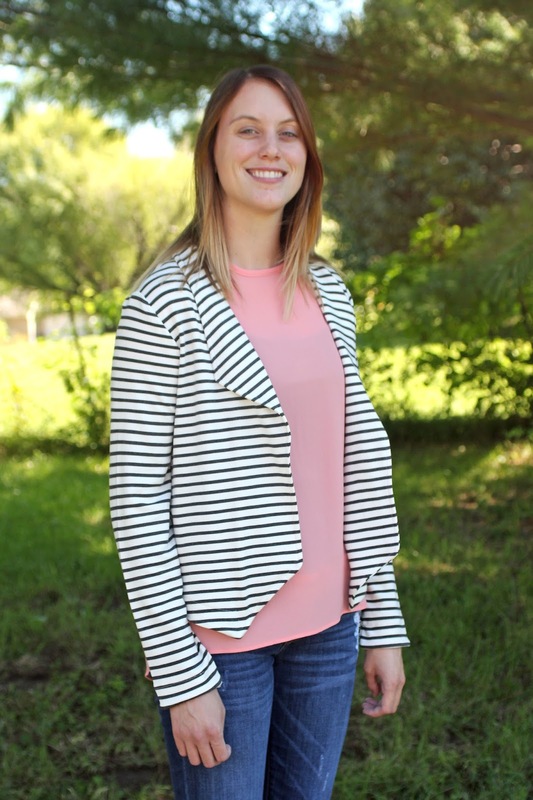 Another Morris Blazer but this time for Kaitlyn and in a stripe. So we went with this Mood Fabrics' St James Gray and Ecru Ponte, which is sold out now. There are a couple other of the St. James stripe ponte available. Please note, I think this ponte is a lighter weight ponte so makes the blazer feel more like a cardigan, in my opinion. I made the blazer just a bit smaller for Kaitlyn but I can tell I needed to make the shoulders a tad bit smaller. I will on the next one, she wants a red ponte one, too. I added two inches to the sleeves for me, so I did for Kaitlyn. Well, my arms are longer, the sleeves for her are just right and the two inches for me, makes it just above the wrist bone. Not much else to say about the Morris Blazer, it is a great pattern, easy to sew and easy to wear. Kaitlyn loved my Simplicity 8178 dress, so I gave it to her adding a sew-on snap for the crossover. I think this stripe Morris would look nice with that and I know she will wear it with her favorite Old Navy red knit dress. It looks great on her! I love this on your daughter . This Morris will be very versitile for her . Need to move my version up on the list. I got the pattern when I saw your first version ! You are building quite an enviable wardrobe together! 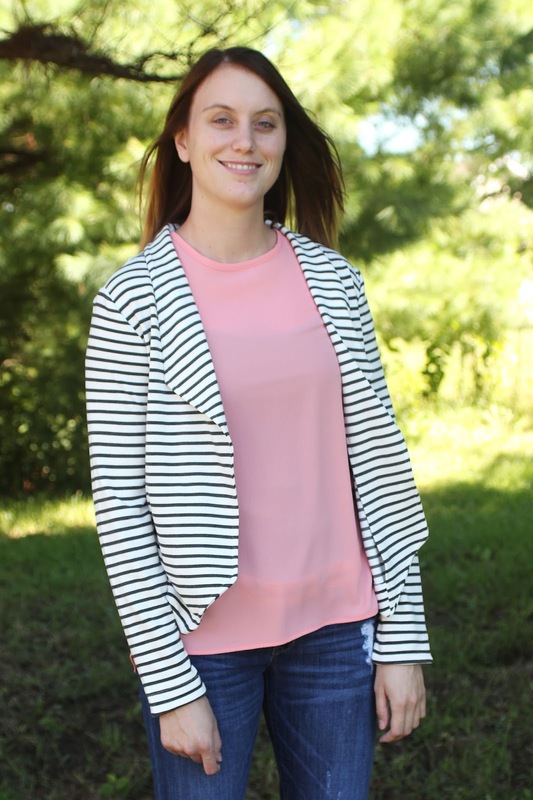 Lovely jacket and love the stripes. This is one of my favorite patterns. Love the stripes! I'm wearing my own Morris blazer as I write (mine is floral). Its a winner in stripes. yes i noticed that the shoulders are off for me as well at the moment i'm completely lost on step 15. any tips?